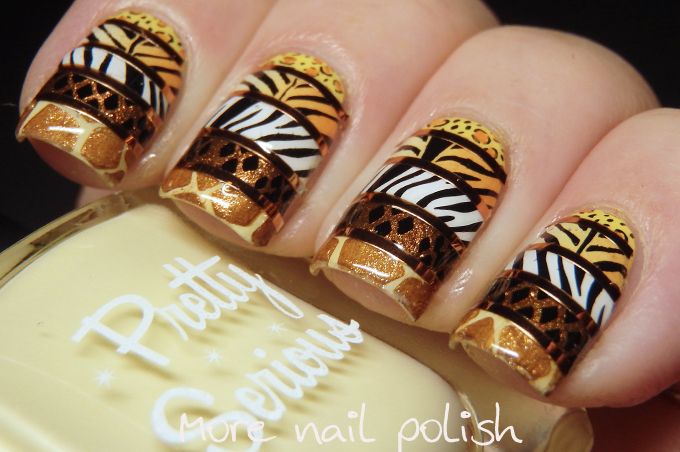 Combining animal prints with a '5' theme was always going to be a tough one, but I'm so happy with how these epic animal print nails turned out. This mani really felt like a bit of an art project. There was painting, stamping, colouring in, cutting and pasting. It was the mani that just kept going and going. This is what I did. I painted all the base colours onto a silicone mat. 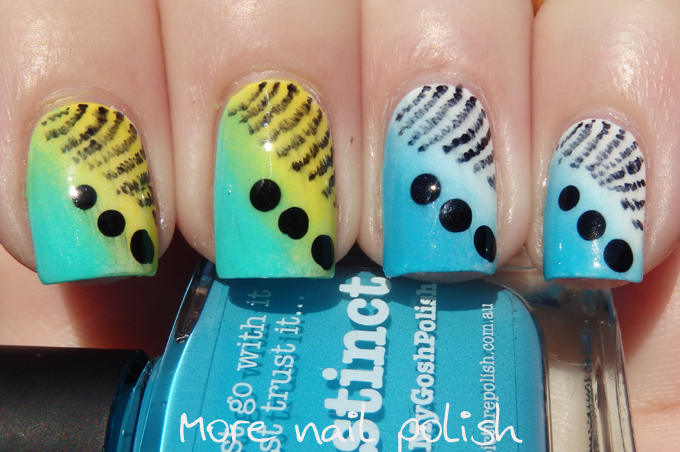 For the tiger print, I sponged a gradient onto the mat. I then stamped on all the designs. 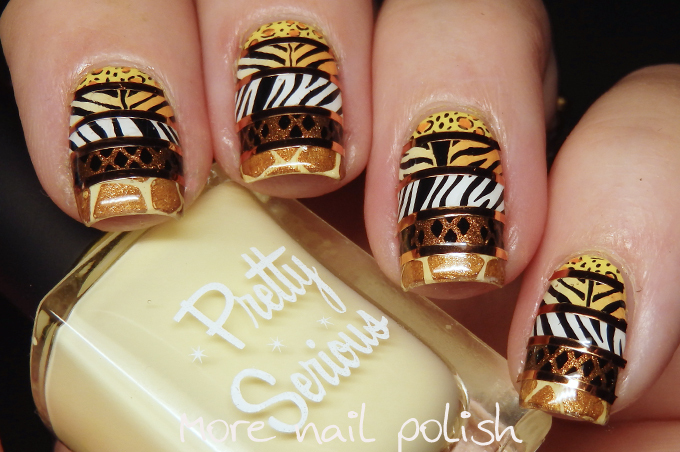 I actually used the same stamping image for both the tiger stripes and the zebra stripes, but stamped over different bases and applied on the nail at a different angle, they looked like different plates. Once all the different prints were dry, I grabbed my scissors and cut thin stripes of each one and stuck them down onto my nails using a layer of top coat. To neaten up the edges, I put a thin stripe of striping tape over each join. In case you were wondering, this took bloody ages to do! So there you have it. 5 animal prints to celebrate the Digital Dozens 5th birthday and the 31DC2017 animal prompt. Prints are leopard, tiger, zebra, snake, giraffe. 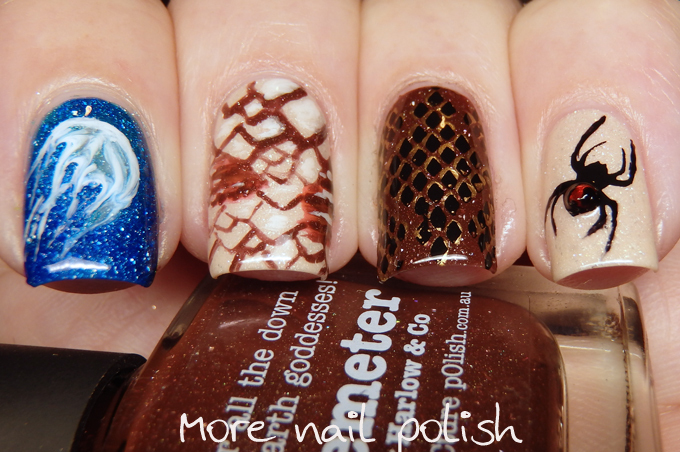 My animal print nails from 2013, 2014, 2015 and 2016! This looks incredible, but wow I would NOT have had the patience for all those stamping decals and stripes! 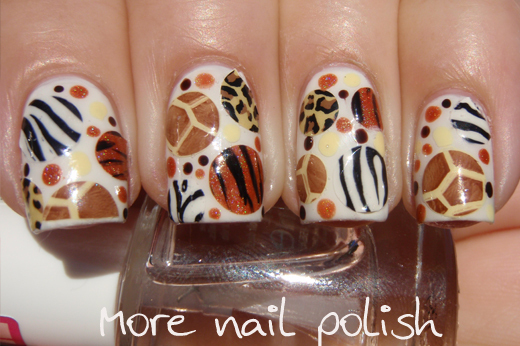 I do not like animal prints at all, but these nails actually look pretty cool! The shimmery polishes make them look better. Terrific!!! Yes, I've done nails using this technique and it DOES take a long time! But these are so worth it!! 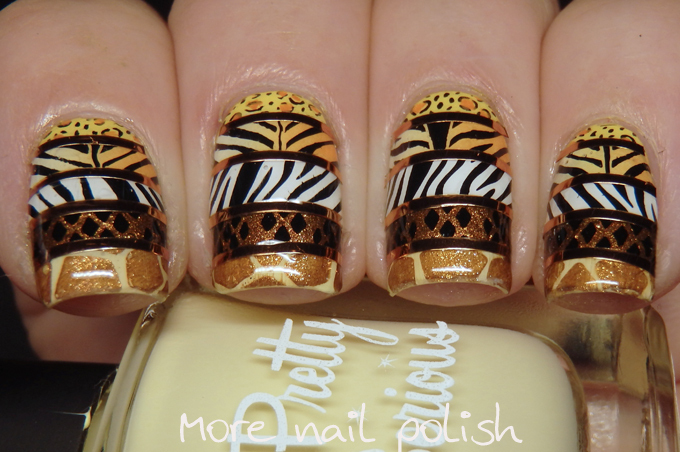 I'm not an animal print fan either, but I really like these.